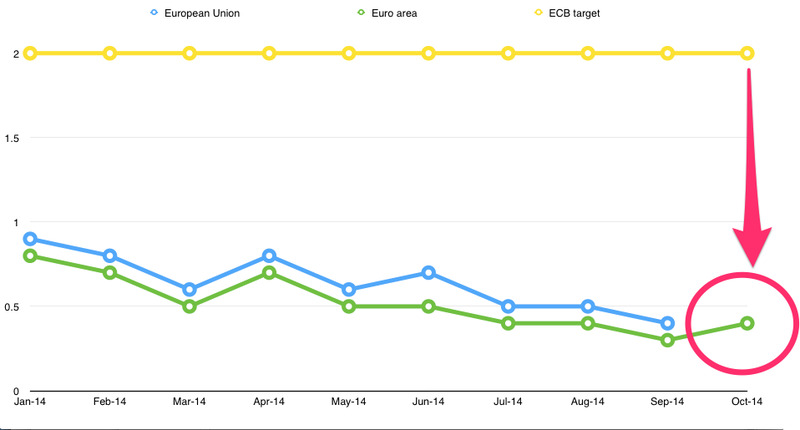 EurostatEU and eurozone inflation vs the ECB’s target. The surprise uptick in euro area inflation in October (to 0.4%) and a modest improvement in economic sentiment may have given the European Central Bank a brief hope that the region might avoid deflation. 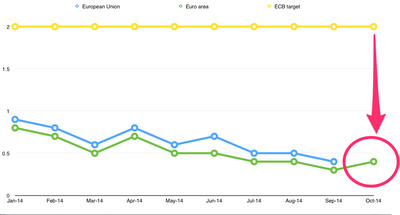 But inflation remains far below the ECB’s 2% target rate. That means there is sense of urgency going into the new interest rate decision coming up on Thursday. There is increasing commonality in core inflation rates across the eurozone countries. This is the first evidence of some systemic cause of weak domestic inflation…This is bad news for the ECB. It suggests the current trough in inflation will be difficult to escape, especially if growth disappoints and expectations slide further. 1. Germany is still afraid of the Weimar Republic. The country has a longstanding fear of inflation that, at this point, looks more emotional than rational. Germany’s insists on sticking to Article 123 of the Lisbon treaty, which bans countries from the ECB from purchasing the government debt of member states (effectively providing a backstop for government spending). The Germans think this would lead to the kind of hyper-inflation that terrorised them during the Weimar Republic of the 1920s. But as that chart shows, we’re nowhere near that. In fact, we’re looking at the opposite — deflation. As things stand, the ECB is unwilling to anger the Germans further by attempting to purchase European states’ government debt even if the situation gets even worse. This means aid to struggling states must be done indirectly through the ECB buying private assets from the market, for example through the covered bond and asset-backed securities purchase programmes. The fear is that these may ultimately be too small in scale and insufficient in their impact to meaningfully increase growth in the region. 2. Europe can’t get the money to go where it’s needed. The collapse of southern European economies, with high unemployment and government spending cuts, has prevented money moving from the stronger to the weaker parts of the region — there is no investment demand. If the ECB’s programmes cannot overcome the private sector’s unwillingness to invest in these countries, then recession and deflation could become inevitable in the euro area without more direct financial support from member states. E.g. richer countries Germany may end up having to transfer taxpayer money or provide guarantees underwritten by German taxpayers to weaker states to get the money moving or else risk a cycle of lower growth driving inflation down leading to lower growth etc.